Another Sunday has come and gone, and we’ve now officially surpassed the midway point of the NFL’s regular season. NFL teams are averaging 24.1 points per game in 2018, a pace which would establish a record if it’s maintained. This was only highlighted further this week, as 11 teams managed to put at least 24 points on the board. Let’s take a further look at some of the individual offensive performances around the league. Going up against a talented Los Angeles Rams’ defensive front didn’t stop Brees and the Saints’ offense from lighting up the scoreboard and handing the Rams their first loss of the season. 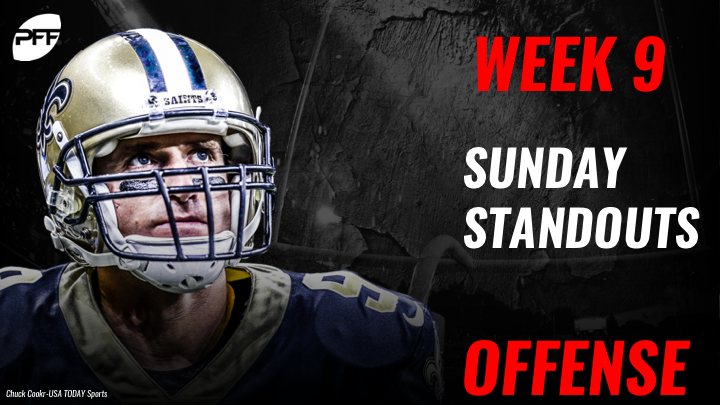 Brees was pressured on a healthy 34% of his dropbacks by Aaron Donald and company on Sunday. He managed a passer rating of 102.5 when pressured, but it was when kept clean that Brees excelled. When free of pressure, Brees went 19-for-25 for 281 yards and three touchdowns. It was an outstanding effort for the second-year wideout, capped off by a tribute to former Saints wide receiver Joe Horn. On 39 routes run, Thomas picked up 211 receiving yards for a league-high 5.41 yards per route run. In a game that could be a deciding factor in home-field advantage in the NFC, Thomas put forth his best game of the season. Humphries was a reliable target for Ryan Fitzpatrick, catching all eight of his targets in the game for 82 receiving yards and two touchdowns. Fitzpatrick’s passer rating when targeting Humphries was 149.0, which was bested by only two other wide receivers with at least five targets this week. The Chiefs offensive juggernaut thunders on, as they once again rolled over the opposing defense en route to their eighth win of the season. Mahomes, as he has been all year, was dominant from a clean pocket. Mahomes attempted 26 passes when not pressured and completed 22 of those passes for 362 yards and three touchdowns. His day could have been even better though, as four of those incompletions came on dropped passes. Mahomes’ favorite target on the day was his big, athletic weapon at tight end. Kelce had seven receptions for 99 yards and two touchdowns on the game. Prior to this week, Kelce had picked up 25 of his 44 receptions when lined up in the slot. Against the Cleveland Browns though, it was as an outside wide receiver that Kelce did most of his damage. Four of his seven receptions came as a wide receiver compared to two as an in-line tight end. A new offensive coordinator brought a welcome change in the usage of Duke Johnson Jr. and he delivered, albeit in a loss. Johnson was very good as a pass-catcher out of the backfield, with nine receptions on nine targets for 78 receiving yards and two touchdowns. Prior to this week, Johnson had just 28 targets on his 171 routes run. He only received one rushing attempt on the day, but he made the most of it, forcing two missed tackles on that rush. It’s been a rough season for Remmers on the Vikings’ offensive line; no one will deny that. He deserves credit for his strong showing on Sunday though, as it was easily his best effort of the season. Remmers allowed just one hurry on 23 pass-blocking snaps, and that is the only pressure he has allowed in the last two weeks after allowing a whopping 29 pressures prior to that. He had a strong showing as a run-blocker against the Detroit Lions to complement his pass-blocking success, as well. Tom Brady was under pressure on just 13.5% of his dropbacks on Sunday night, and a large part of that was his tackle, Marcus Cannon. Cannon did not allow a single hurry, hit, or sack on 38 pass-blocking snaps. On 187 pass-blocking snaps this season, Cannon has not yet allowed a sack.